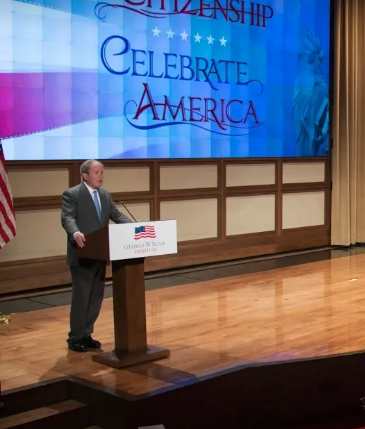 For years, the Obama Administration has been pushing the fable that the border is secure and drug cartel violence is limited to areas south of the U.S. Mexico Border. A recent report on TexasGOPVote.com by Brandon Darby and other news reports seem to indicate that is just not true. Recently, I traveled to Tucson, Arizona to attend the Brian Terry Foundation Benefit Dinner in honor of fallen U.S. Border Patrol Agent Brian Terry. While in Tucson, I headed down to Arizona's southeastern border with Mexico and visited with Cochise County Sheriff Mark Dannels who had a lot to say on this subject. Note: A complete transcript of the video interview below is available below the body of this posting. Dannels spoke candidly about how the drug cartel related violence is increasing in his county. He described an incident that occurred near the community of Elfrida, AZ where cartel members allegedly opened fire on a home shooting four people. "We air evacuated four of them into Tucson for critical injuries. We detained nine [suspects] initially -indicted some of those folks for attempted murder. Nobody’s died as a result of [the shooting]. 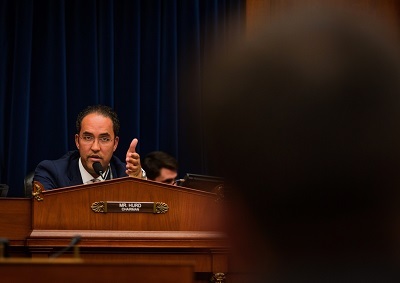 But it’s the violence in these communities that are unfortunately our border folks, our citizens are becoming numb to." Dannels also related an incident where a 60 year old woman working for the National Park Service was brutally assaulted about three weeks ago. This incident was covered by TexasGOPVote's Brandon Darby. Dannels described the incident stating that "she was brutally assaulted by a smuggler that literally crushed her head in with a brick." He illustrated the shear brutality of the attack stating, "He didn't want to do it once, he did it twice, I am sad to say. He then stole her vehicle." Dannels said the attacker was so brazen as to even go to a drive through window in town with the stolen government vehicle. Linked here is the Sheriff's Office press release on the attack. The Sheriff explained the escalating violence and crime in his community. "Over the last six months," he explained, "we’ve had six home invasions where they’re stealing arms, rifles, handguns, and we’ve arrested six of those as a result of our new border team that’s made up of sheriff folks, federal agents, and law enforcement from border patrol and customs that are helping us do this. But it’s a problem down here." Dannels took me down to the border where the security is not quite as tight as the strict enforcement area near Naco, where I visited last December. 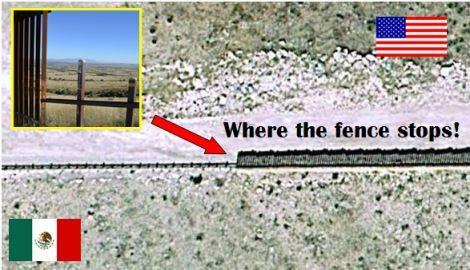 There, the border fence is a solid wall with a smooth gravel patrol road and is well lit at night. This is a stark contrast to what I was shown about twenty miles to the east. Here the fence is much shorter and has gaping holes where the Border Patrol raises sections of the fence to allow rain flooding to flow without damaging the fencing. And then, almost without reason, this excuse for a fence just comes to a halt and is replaced by what can best be described as a steel cattle fence. You can't drive through it, but you can easily step right over it while carrying your load of drugs. Sheriff Dannels explained the Border Patrol's security plan is to move resources back away from the border and to station more of there resources around population centers and highway checkpoints like the one I encountered when I was driving south from Tucson. 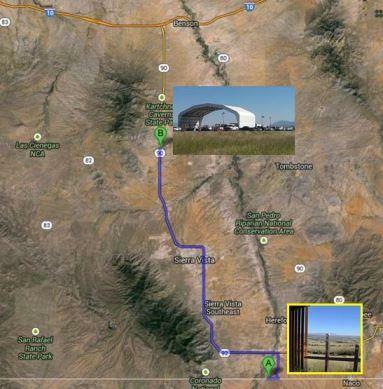 The checkpoint is approximately 40 miles from the border. It begs the question if this is being done because of the Border Patrol's command decision to have agents stand down from conflicts with drug smugglers and human traffickers. Whatever the reason, it leaves Sheriff Dannels with an even heavier load on their shoulders. 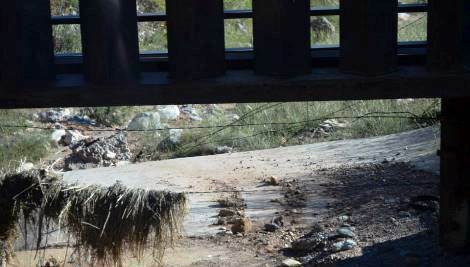 The area we visited is not far from the location where Border Patrol Agent Brian Terry was murdered when his BORTAC team encountered a Mexican RIP-crew (bandits that prey on other smugglers and illegal immigrants). I first met Dannels in December last year after he had been elected sheriff but before he was sworn in. At that time he described his plans to emphasize security along the border and his desire to protect his citizens where the federal government was failing in its duties. He pledged to create a border security team which he as already accomplished in his new post as sheriff of this historic county where Wyatt Earp was once a marshal in the city of Tombstone and later a U.S. Marshal for Arizona. "That team’s primary role is to work crimes with a nexus to the border," Dannels explained. "They’re not going to be sitting on the border where you and I are standing. They’re going to work the private, public lands, and the recreational lands to help the citizens’ quality of life and to identify and prevent those type of crimes." The Sheriff conceded the border is a federal problem but emphasized his responsibility to protect the residents of his communities from these cartel members and the state crimes they commit after they cross the border. To that end, Dannels has helped create a program to fast-track these criminals from arrest to imprisonment. Dannels detailed the program stating, "Our new border team, again, working the interior part of Cochise County, my county, is the fact that when we get smugglers, what we’re doing is snagging them up and prosecuting them on a state level. And we have an early resolution court that actually takes them in within two weeks. They’re already in our prison system for a two year sentence. So you want to smuggle dope through this county, we’re going to put you in prison for two years; working with a partnership with our county attorney. We’re not going to mess around with them." Messing around is one thing Sheriff Dannels does not do. He is a cop's cop type of sheriff. He worked Cochise county for many years before moving to Oregon to take a job as chief of police in order to gain executive management experience before returning to run for sheriff. He replaced the late Sheriff Larry Dever who was killed in a single car accident last year. Of course, protecting his residents from the crimes committed by drug cartels is but one part of his duties as Cochise County Sheriff. He and his 85 deputies cover 63,000 square miles - an area about 35 times the size of Harris County in Texas. They must deal with all the normal types of crimes handled by local law enforcement agencies across the country work. Dannels takes all aspects of his duties as sheriff seriously. He is what has become known as a "Constitutional Sheriff". A sheriff that believes that among his other duties and responsibilities comes an obligation to defend the Constitution of the United States and his State of Arizona. When the 2nd Amendment came under attack earlier this year, Dannels was one of the local sheriffs that committed to his residents that he would defend them against an over-reaching federal government. He joined with sheriffs across the nation in signing a letter committing to protect the 2nd Amendment. 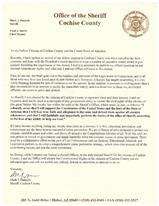 "As do sheriffs throughout this county," Dannels explained. "We take a constitutional oath. And that oath is to support the constitution and the laws of the lands that we were embraced to protect. So to me it’s simple when it comes to our second amendment. And that is to support that." "My ranchers are out there unprotected in a county that is not protected by the border," he continued. "And the open seams of our border that have assaults, home invasions, murders; without protection. I couldn’t even imagine that. I’m a constitutional sheriff. We support the constitution. I took an oath for that. The idea that I can’t support that oath is the day I stop being sheriff." While attending the Brian Terry Foundation Benefit Dinner in Tucson the day before meeting with Dannels, I encountered some of his constituents who told me they had not voted for him, but now have been won over to his side because of the work he has done in his short ten months in office. I asked him how he as accomplished this. "Number one," he explained, "I’m being transparent with them. Something that I know there’s a lot of frustration with considering our federal government. We’re being transparent, we’re being upfront. We’re holding meetings with them. We’re setting up programs that show that we’ve listened to them. These are the programs that can directly affect their quality of life." He continued, "Right now we’re doing our darndest to enhance the quality of life with our citizens here and at least working in partnership with them. A lot goes with that. It goes along with our public safety partners, our federal agencies, and our state and other city police departments and together we have strong passion to do that. And it’s working. It’s working..."
Sheriff Mark Dannels is right. What he is doing is working. He and the men and women of his department are risking their lives on a daily basis to help secure a border that the federal government simply will not do. He is taking it to the drug cartels and quickly impacting their ability to move product through his county. That is dangerous work. Sheriff Dannels is making Cochise County safer for the people who live and work there including many of our soldiers from Fort Huachuca who live in his Sierra Vista community. 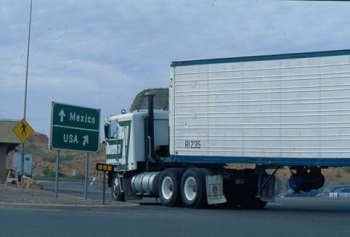 While doing so, he is making our country safer as the drugs and human cargo that would otherwise pass through his county are just a short trip up to Interstate 10 and then on to points east or west. TexasGOPVote will continue to bring you reports about our nation's lack of border security until such time as the federal government finally does its job. Until then, thank you Sheriff! Bob Price: We’re down on the border southeast of Sierra Vista, Arizona with Sheriff Mark Dannels of Cochise County. Sheriff, thank you for taking the time to talk to Texas GOP Vote today. Bob Price: Now we met you about a year ago just before you’d been elected but hadn’t been sworn in yet. It’s great to get a chance to come back and see you here. Sheriff Dannels: Good to have you hear. See the real border. Bob Price: Yeah. Absolutely. When I was out here in December, I went to Naco which is in your county as well, and the fence is totally different there. The security is totally different. You can see here. This thing that anybody can just walk across. What’s going on along here? We’ve been driving for about a half an hour now. Haven’t seen any border patrol. Anything except your people. Sheriff Dannels: This is the federal government’s plan of border security. You’re living it and seeing it right now. Where you have security measures in a plethora form near the populated areas which is about due east of us thirty miles. To the west of us and over these hills, is as the crow flies, about five miles, is a town of 40,000 people. And you see what’s protecting it. But just thirty miles east of us, there’s a port of entry. Part of the plan was port of entries and the populated areas; such as Yuma, San Diego, and El Paso; have a lot more measures in place to make them safer areas. This is a result of rerouting the illegal activities from those areas to this area here. If you look just to your back side, Bob, there’s a trail and behind this camera it trails up the mountain. And then up and over they go. Up into different areas where they get picked up and to their stashes located in the city and county areas behind us. Bob Price: This trail is right down here that we’ll show a picture of while we’re talking. That’s trafficked so much that it’s worn down like what we’d call a cattle trail in Texas. Bob Price: That’s their regular pathway along here. Sheriff Dannels: When the night falls, it’s when the activity grows. And you’re exactly right. If you go up the hill and then take a left and go into the flatlands to the South of us here, it’s wide open. You don’t see the technology that you do 30 miles east of us. 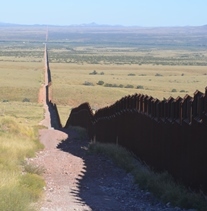 Bob Price: When we were talking while driving out here today, it sounds like the violence along this border pretty much before had been restricted to the Southern side of the border. Recently it’s really escalating on this side. Tell us about the shootout that happened. Sheriff Dannels: Recently here a week ago, we had a shootout with the drug folks. The cartels. 100 plus round were shot. Four people were shot. We air evacuated four of them into Tucson for critical injuries. We detained nine initially. Indicted some of those folks for attempted murder. Nobody’s died as a result of that, but it’s the violence in these communities that are encroaching our border. Folks in the communities, our citizens are becoming numb to. We had a national park service here about a month ago, three weeks ago, that was brutally assaulted by a smuggler that literally crushed her head in with a brick. He didn’t only do it once, but did it twice. Sad to say. Then he sold her vehicle. Again, the violence on our East side are home invasions. Over the last six months, we’ve had six home invasions where they’re stealing arms, rifles, handguns, and we’ve arrested six of those as a result of our new border team that’s made up of sheriff folks, federal agents, and law enforcement from border patrol and customs that are helping us do this. But it’s a problem down here. Bob Price: This border team that you mentioned; that’s something that you created since you were sworn in, in January. What is the role of that team? 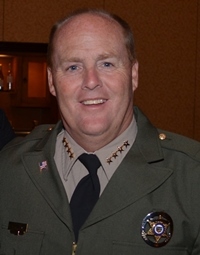 Sheriff Dannels: That team’s primary role is to work crimes with a nexus to the border. They’re not going to be sitting on the border where you and I are standing. They’re going to work the private, public lands, and the recreational lands to help the citizens’ quality of life and to identify and prevent those type of crimes. Bob Price: A lot of sheriffs, when you talk to them about border security, they’ll say that immigration is not a state issue. Not something we should be involved in. Clearly, you’re enforcing state laws here. Bob Price: When people break into these homes, or trespass on these properties; these are state crimes and you’re going after that. Sheriff Dannels: That is correct. This border is a federal problem. I’ll put it on the record. It’s a federal problem. We have 1300 border patrol agents in our county and there are 200 customs folk. So 1500 federal agents in a county that’s got 63,000 square miles and 83 miles of international border. You’d think you’d have a resolution here but we don’t. We don’t. The emphasis is on the port of entries and somewhat of the populated areas. Bob Price: Now I saw 20-30 custom vehicles at the checkpoint 40-50 miles inland up here north of town. What kind of effectiveness does that have? I know that’s not these guys’ fault. These guys are doing what they’re told to do. Sheriff Dannels: Let me just put on the record that the men and women of border patrol do a hell of a job, and they’ve got a very dangerous job. Please don’t read me wrong in that we work very closely with them. We’re proud to have them here. The issue lies with the leadership to the north of me and to the east of me; all the way to the east of me. Their strategic plan on how they deploy. I’ve said it before and I’ll say it again. When our federal leaders see that border is not a discretionary program and that it should be mandated program, we’ll see a difference down here. Right now I don’t see that paradigm shift. Bob Price: The other thing that we talked about when we were driving down here is what you’re doing with the court system. You got a way with moving these guys through the system and getting them convicted and in prison quickly where they can stop being a threat here on the border. Tell us about that. Sheriff Dannels: Our new border team, again, working the interior part of Cochise County, my county, is the fact that if we get smugglers, what we’re doing is snagging them up and prosecuting them on a state level. And we have an early resolution court that actually takes them in within two weeks. They’re already in our prison system for a two year sentence. So you want to smuggle dope through this county, we’re going to put you in prison for two years; working with a partnership with our county attorney. We’re not going to mess around with them. Bob Price: Now some people would say “two years?” That’s not very much for what they’re doing, but you’re quickly getting these guys out of the system and out of the resources of what the drug cartels can use. They’ve got to replace those people that are in at that point. Sheriff Dannels: They have to replace them plus we’re taking their product. They can’t make money if I have their product, and we’ll continue doing that. We don’t want them in our county. They want to move east, they want to move west; then move. But for right now, we don’t want them in our county. We’re going to do our part. Bob Price: How many miles of border do you have in your county? Bob Price: 83 miles. And there’s 1300 border patrol agents? Sheriff Dannels: 1300 border patrol agents and 200 customs. Bob Price: How many deputies do you have? Sheriff Dannels: 86 and that includes me. And you take away the fact that I have right now seven in the academy and we’re still three or four down. You’re running a staff that’s about seventy-some people. That’s not a lot. And I have 63,000 square miles and the general crime that we deal with; domestics, DUIs, fights, burglaries. The general crimes all law enforcement agencies at a local level deal with. It puts a real burden on us. No doubt. Bob Price: Now you’ve made a priority of the border. Not necessarily to do the federal government’s job, but to protect these residents that live in the towns over there. Sheriff Dannels: Yeah that’s a mandate. I understand the situational awareness that we have to have on the border. Number two, it’s an expectation of me for my citizens and me and it comes to: I need to protect them. 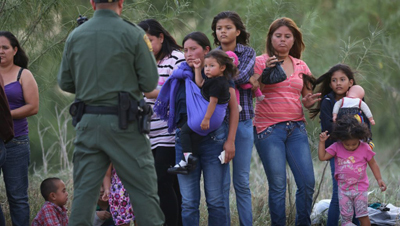 What the border patrol does, what the federal government does on the border. I can’t control that. But I can control what happens in my county, and we’re going to do our part. Bob Price: Let’s get back in the truck and drive around a little bit again, and look at some more things that you want to show us and we’ll get back to the camera in a minute. Sheriff Dannels: Alright, sounds good. Thanks Bob. Bob Price: Well we just back from our trip to the border with Sheriff Dannels and we’re sitting down here in the front of your house as the heat of the Arizona summer is cooling down a little bit. I can feel it dropping. It drops fast out here. Sheriff Dannels: It does. It’s a beautiful time of year for Arizona. It’s nice and cool at night. Bob Price: Yeah we really like that. In Texas, it it’s 95 when the sun goes down, it’ll be 93 about midnight. The humidity holds the heat. Let’s talk about how down at the border you’re dealing with an aspect because the federal government won’t take on its responsibilities properly with securing the border. Let’s talk about the rest of your job as sheriff. Tell us what Cochise County is like. It’s a historic county for law enforcement in Arizona and the West history. Sheriff Dannels: It’s a very western county. It has its heritage in very ranching agriculture. 89 percent of our county’s livelihood comes from that. We do have a military base. Fort Huachuca is here in Sierra Vista which is kind of in the corner county which is a metro type area; but again, 89 percent of our county is the ranching community. Very westernized. Bob Price: You have residents in your community that have tens of thousands of acres ranches and large wide open spaces, and you have cities that you have to deal with as well. You have local police departments but residential communities and a lot of those types of issues as well. Sheriff Dannels: Yes, that’s very true. Bob Price: Now one of the things that you’ve talked about in the past is your role as sheriff as protecting the rights of your people; particularly in relation to the second amendment. Especially when things were going on with President Obama attacking the second amendment. You’ve got this letter that you’ve put out making a very strong statement. Sheriff Dannels: Well as sheriff throughout this county, we take a constitutional oath. And that oath is to support the constitution and the laws of the lands that we were embraced to protect. So to me it’s simple when it comes to our second amendment. And that is to support that. You know I look at that year and I apply that to Cochise county where if we ever, fear we not, take the guns away and violate our constitution and the second amendment, my ranchers are out there unprotected in a county that is not protected by the border. And the open seams of our border that have assaults, home invasions, murders; without protection. I couldn’t even imagine that. I’m a constitutional sheriff. We support the constitution. I took an oath for that. The idea that I can’t support that oath is the day I stop being sheriff. I came out with a comprehensive statement in regards to that: to support the constitution and the wording within. I’m very strong about this when I speak. Our culture and society has changed over the last 30 to 50 years and you look at what’s changed. The three institutions that have really changed over these last 3 to 5 decades are simply the ones that are fractured: family, faith and education. They are fractured and I say this. It’s the evil that works within our communities like law enforcement, public safety, and each individual in our communities has to take a situational awareness and heighten that when it comes to making a difference. Embrace our neighbors. Embrace our families and our loved ones. Change from where we’re at now to where we were at. Look at our history and repeat that so we can get back to taking care of those family values. Bob Price: Now when you became sheriff in January, of course you’d have had a long career here before you moved up to Oregon, became chief of police up there, and moved back here and became sheriff. What was your biggest surprise from what had changed between when you were here before to when you came back? Sheriff Dannels: Well I’ve had the benefit of work. I was in the military. I grew up in Illinois. Came out here with the military and got out of the military in 1984 and joined law enforcement, so I’ve had the luxury and benefit of working in Cochise County since 1984. 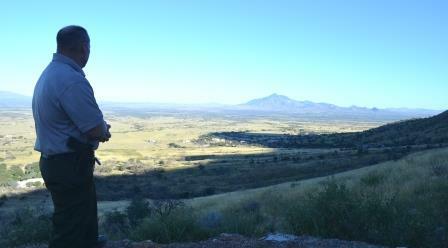 Even when I went to Oregon, I came back every three months to work in Cochise County. I’ve seen the change. We’ve always had border issues. 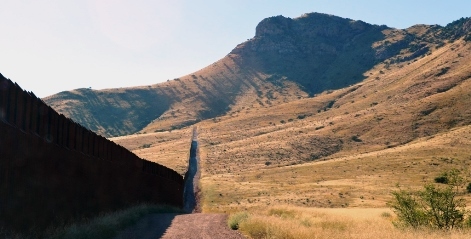 The difference between thirty years ago and now is the complexity with the border; the failed attempts to use the border as a discretionary political posturing by some instead of just making the border a mandate. Look at the history here within the last twelve years. Just with the 9/11 attack, 3000 of our Americans were killed by an evil that came into our country and all the domestic terrorism that happens. You look at all this and realize that we as society need to do a better job of protecting ourselves, our communities, our society, and right now our borders, the 2000 plus miles of southwest border, and we’re vulnerable here. We’re so vulnerable here. We talked about the drugs and the folks coming across for human smuggling. One thing that we forget is the terrorist element that comes across our southwest border. That should scare the heck out of you. And the wide open borders that we see here in Cochise County that scare me as sheriff. I know it scares my citizens but unfortunately we’ve become numb here in Cochise County based on the fact of the lack of attention towards our border. Have we done better in certain parts of our southwest border? Yes. They have, and that was their plan. Have they neglected parts of the southwest border? I consider the non-populated areas. Yes they have. They need to redefine the plan before they put the maintenance key up in the border security and don’t blame immigration reform with border security. They’re two separate programs. Bob Price: Now there’s a lot of feeling that you have to address one before the other. They are two completely separate issues. They’re also very complicatedly interwoven. One of the things that we look at is that if you increase the border security without fixing the immigration problem, then it creates a larger demand for the human trafficking side of it because there’s not a legal way for people to come here that do want to work. I talked to some residents from Cochise County last night. We were at the Brian Terry Foundation event. You were there. It was interesting that you were winning people over here. One of the things that I’ve noticed is that you seem to be a cop’s cop. So how does that impact your relationship with the community? Sheriff Dannels: Number one, I’m being transparent with them. Something that I know there’s a lot of frustration with considering our federal government. We’re being transparent, we’re being upfront. We’re holding meetings with them. We’re setting up programs that show that we’ve listened to them. These are the programs that can directly affect their quality of life. We’re putting efforts forward to see if it’ll work. As an elected official, that’s hard for me to say sometimes because the label of being elected is the word of being political. Being a cop for almost thirty years and working operations and just trying to make a difference, a positive difference. And now I’m elected and I get the political stigma. Nothing’s changed. I look at the political side very blessed to be elected as a sheriff. I put the political side on one side and I focus on my public safety component and how I can make a positive difference. That goes with putting programs together and being effective, being efficient, and comes with the funding of it. Right now we’re doing our darndest to enhance the quality of life with our citizens here and at least working in partnership with them. A lot goes with that. It goes along with our public safety partners, our federal agencies, and our state and other city police departments and together we have strong passion to do that. And it’s working. It’s working. Bob Price: I want to thank you for taking the time to take me down to the border and take a look at what’s going on down there. As much attention that I paid to the issue, it’s still shocking to come down there and see firsthand the darkness of one-ended fence versus just wide open border down there. Bob Price: You talked to earlier when we were on the border about this shootout that happened and the local media covered that and the national media never picked that up. People aren’t really aware of what life is really like inside the 50 mile perimeter that the border patrol is setting up. Sheriff Dannels: It is alarming to live in a community. And we have a lot of rural communities in Cochise County and this one was a community of a couple thousand people that a lot of agriculture and farming were going on in this community. They’re great people with great values that wake up at three in the morning to huge shootouts with drug folks and hundred rounds spent, fired, and four people shot. I mean you think of the big cities when the stuff happens right? But no. This is rural America down here in the border. This is sad. Bob Price: Well thank you again for your hospitality but more importantly thank you for your service to this state and our nation because through here is what affects the cities all across the country and you’re on the front lines. I appreciate it if we can come back and visit with you again in the future. Sheriff Dannels: We’ll leave the line out for you Bob, and second of all, I appreciate what you’re doing to get the word out there that it is not the glamour border that they like to paint it. Thank you. Sheriff Dannels: Thank you Bob.